Our mobile car wash services are available to you by simply calling our toll free number and speaking with our friendly and knowledgeable representatives. 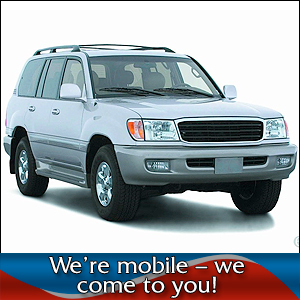 Our experienced drivers will come to your vehicle and detail it on your preferred site. Call today for more information. Car Genie Mobile Car Wash & Detail is here to serve you! Car Detailing - We offer full service mobile car washing and detailing. Our broad range of services includes carpet and seat shampooing or conditioning, waxing, polishing, steam cleaning engines, tar removal, tree sap removal, tire detailing and many other options. Fleet Washes - We accept contracts from any size business, including government agencies, independent companies and corporations. Locations - We offer mobile detailing throughout the United States. We will come to your location in Mississippi, as well as Tennessee, Arkansas, Georgia, and Arizona. If you aren't in these states, call us to check availability in your area. We can accommodate any schedule and most locations in the southeast! Contact Car Genie Mobile Car Wash & Detail today at 877-61-GENIE ( 4-3643 ) to schedule your appointment.